Back to the Future: The Game is the first game by Telltale Games as part of an agreement to make games based on NBC Universal properties. The first episode was released in December 2010. The remaining games in this five part episodic series were released in the following months. The original version was released for PC, Mac, PlayStation 3, iOS, and Wii. 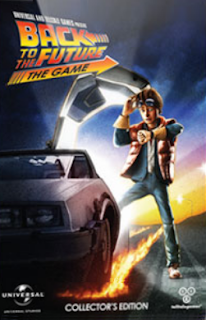 A 30th Anniversary edition with improved textures and featuring the voice talents of Tom Wilson as Biff Tannen was released for Xbox 360, PlayStation 4, and Xbox One on October 13, 2015. Andrew Chaikin voiced Biff in the original release. Doc has been gone for six months when the DeLorean suddenly shows up at his lab. Marty's trip to 1931 caused a critical change in the time line that must be corrected. The timeline changes aren't fixed as well as Marty thought when he lands in an alternate version of Hill Valley. Marty must get a time machine in the alternate 1986 so he can go back to 1931 to get the time line back on track. The conclusion is an adventure involving the past, present, and future of Hill Valley.